Hi everyone! Happy Sunday! Yesterday was a lot of fun during Banana Peel's Summer in the City event. I totally enjoyed it. It seems like it's been a while since the last time I went to an event. Lately, I'm not really busy since I'm having a little vacation after I resigned from my former company and still looking for jobs, hopefully, I will be pursuing a career related to my educational career goals. 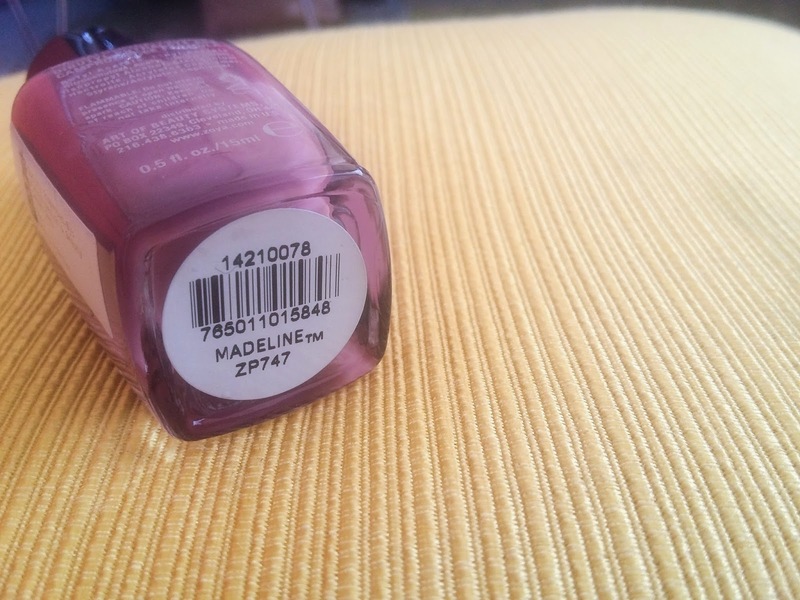 So anyways, for today I will be sharing to you Zoya Professional Lacquer in Madeline. Yesterday was a fun summer in the city event and I'm so happy that Banana Peel had Beauty and Butter as one of their sponsoring brands. I was actually scheduling a visit to their nail salon (Eastwood branch since I saw it when I was still based in Eastwood) to try their services, and luckily I got the chance to try it out. Although the free manicure I had wasn't really satisfying, I can still say that I am happy with my nails. I wouldn't be talking about the service, but more on the nail polish used. Starting today, every time I visit nail salons for a pamper session, I'm going to feature the nail polish used, just to add up for a blog post. Hihi. At the bottom you can find the name of the nail polish and the product code. Local brand nail polish usually have their polish names at the back of the bottle. Here's my nailfie! Pardon the wet part of my nails since the nail technician put several coats of nail polish and quick dry coat to prevent the polish from cracking and staying for a longer time. But it looks good when it dried. However it didn't stay that long. I don't know if the manicure service itself wasn't really nice or the nail polish wasn't nice and consistent. The polish cracked and was removed the same day I had it on. Luckily it's free. I totally love the color and how it looks better on my nails since I love pastel and every pink shade that I can get. But I was disappointed that it didn't last long on my nails. I might give this brand another try when I find it in the market, but being on the price-y side, 450php a bottle is... I would try other imported brands. Hi, super love your nails. Where branch did you get your nails done? so far I super like their service sa SM Mega :) Planning to go back :) btw, love your nails ah! nice color!